There’s been quite some talk over the years about Ford’s historical Grabber Blue Mustang, one of the most iconic Ford Mustang colors ever made. Although some claim that the color is just too close to powder blue and others claim that it’s too pastel or too similar to Petty Blue, this color has captured the attention of Ford Mustang enthusiasts for decades. It is still a collector’s item to this very day. 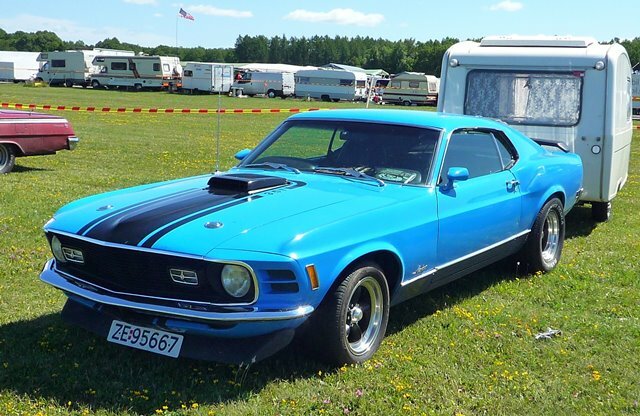 The Ford Grabber Blue is no stranger to Mustang enthusiasts of the ‘70s era as it was initially introduced in 1969 and increased its popularity during the early ‘70s. It mainly gained popularity on the Mustang Boss 302 pony, which was in great demand during that era. Eventually, the color was referred to as other colors during Ford promotions. Those cross or promotional names were referred to as Competition Blue, Blue Lightning and Pinto Blue. These colors were used mainly during the years of 1969 to 1989 sparingly on models such as the Ford Mustang, the Pinto, the Diamond truck, the Ford truck, the Reo truck and the Falcon. Since Grabber Blue is such a unique color for cars, many often wonder where the color came from. Well, based on some research, the color is actually very similar to (if not the same color as) and Petty Blue. Petty Blue was formed by accident by Petty brothers Richard and Maurice when they ran out of paint while attempting to paint a car. They needed more white paint and more dark blue paint so that the entire car could be covered. But consequently, they ended up having to mix the dark blue and the white paints together, which formed the color referred to as Petty Blue. Other research indicates that this color was actually referred to as Matra Blue when it was produced by Matra. The Matra sports cars along with Formula One race cars participated in competitions against the Ferrari. During that time, the color used on those cars was referred to as the French Racing Blue (Bugatti) during the early part of the century and was later referred to as Matra Blue. During the year of 1973, Ford produced a lighter shade referred to as Light Grabber Blue and also called Bright Blue in some instances. Initially, the Grabber Blue Mustang was only available exclusively on the 1969 model of the Shelby Mustangs. Since there was such a fast and positive reaction to this color, that next year, Ford made the color available as an option for all of their pony cars. They also made the color available on some of their heavy-duty trucks and on the Falcon as well. Interestingly enough, the Grabber Blue Mustang faded from the Mustang lineup for several years. It was finally reintroduced back into the marketplace during the year of 2010. This iconic color was also enjoyed by drivers who were enthusiasts of other Ford models as well. Ford used the color on some of Ford’s other models but with different promotional names. For example, in 1969 the color was only used exclusively on the Shelby model of the Ford Mustang. In the year of 1970 however it was used on the Falcon, the Ford truck, the Mercury and other Mustang models such as the M3657. During the year of 1971 and 1972, the Competition Blue was used on the Ford Mercury model. In 1971 and 1972, the Pinto Blue was used on the Ford Pinto. Blue Lightning was used on the Diamond Truck and the Ford Reo Truck during the year of 1974. Based on a statistical report prepared by Ford, the color blue is the second most popular color in the history of the Ford Mustang lineup. Historically it is second to the color red, which happens to be the most popular color in the history of the Ford Mustang. But of course, in more recent years today’s generation happens to gravitate to more basic, conservative colors such as black, which has come to be the most preferred color when purchasing the newer models of Ford’s Mustangs. It appears that Grabber Blue tends to serve more as a collector’s item today more so than it did in the past when it was the primary vehicle of choice for the Ford Mustang enthusiast.